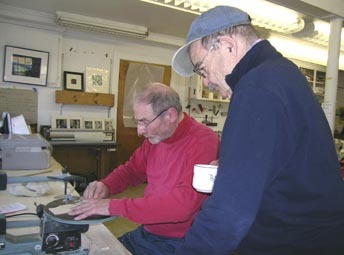 An introduction workshop will be given at the Midcoast Printmakers studio/print shop at the Round Top Farm on Business Route 1, Darmiscotta, Maine on February 12, 2011 from 9:30 AM to 4 PM. Instruction covers preparing the block, transferring the design, how to safely use the scroll saw to cut shapes, inking, and printing. The beauty of this technique lies in its simple self registration using one block for color, cut into shapes similar to a jig saw puzzle and printing without a press using a barren and/or wooden spoon. In addition, basic traditional carving and other techniques will be covered as an adjunct to the scroll saw technique. Blocks, ink and paper will be supplied. The fee is $75. for the day. There is a $40. preregistration deposit fee payable to Midcoast Printmakers, Inc., and mailed to: P.O. Box 832, Damariscotta, ME 04543. Call Martin at 354-2290 to reserve your spot. The Midcoast Printmakers are pleased to announce that from 10 AM until 4 PM on January 8 and 9 beginners and experienced artists alike are encouraged to come and have a grand time creating monoprints and monotypes at the Midcoast Printmakers studio at Roundtop Farm. Work made during the workshop can be new or incorporate bits of unresolved work in watercolor, acrylic, collage or graphite brought by participants. An attitude of sharing and cooperation at the large and small press will ensure that everyone has a body of work to take home at the end of the day. At this time of year who couldn’t benefit from a day in a sunny studio mixing color and enjoying company of others while creating artwork. Healthy snacks as well as tea and coffee will be abundance. Instructor/advisors on hand will be Delphine Sherin and Debra Arter who both have advanced degrees in printmaking and years of experience in the medium. 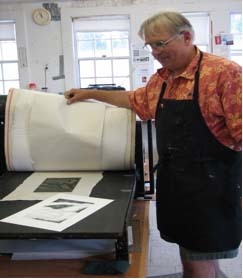 Midcoast Printmakers is a non-profit organization dedicated to the art of innovative and traditional printmaking. Participants can sign up for one day or two by calling Debra at 563-7100. Cost is $60 per day with nominal materials fee assessed depending on materials used. Space is limited so call early!